A floral illustration on page 32. The colors are still vibrant. The Voynich manuscript, described as "the world's most mysterious manuscript", is a work which dates to the early 15th century, possibly from northern Italy. It is named after the book dealer Wilfrid Michael Voynich, who purchased it in 1912. Some pages are missing, but the current version comprises about 240 vellum pages, most with illustrations. Much of the manuscript resembles herbal manuscripts of the time period, seeming to present illustrations and information about plants and their possible uses for medical purposes. However, most of the plants do not match known species, and the manuscript's script and language remain unknown and unreadable. Possibly some form of encrypted ciphertext, the Voynich manuscript has been studied by many professional and amateur cryptographers, including American and British codebreakers from both World War I and World War II. As yet, it has defied all decipherment attempts, becoming a cause célèbre of historical cryptology. The mystery surrounding it has excited the popular imagination, making the manuscript a subject of both fanciful theories and novels. None of the many speculative solutions proposed over the last hundred years has yet been independently verified. The Voynich manuscript was donated to Yale University's Beinecke Rare Book and Manuscript Library in 1969, where it is catalogued under call number MS 408 and called a "Cipher Manuscript". Perhaps the appeal of Voynich research is that (a) it is truly cross-disciplinary, and (b) it rewards endeavour and persistence. This wikibook is intended to help you get started on what has already been (for some) a long road of (self-)discovery - the page you may find most useful at first is the Guide To Voynich Jargon. Illustrated medieval folio written in an undeciphered script. From the illustrations – hairstyles and features of the human ﬁgures – as well as the shapes of the glyphs, the manuscript is posited to have been created in Europe. Carbon-dating at the University of Arizona has found that the vellum was created in the 15th century, and McCrone Associates has asserted that the ink was added shortly afterwards. The manuscript is divided into quires – sections made out of folded parchment, each of which consists of folios, with writing on both sides of each folio (Reeds, 2002). 225 pages include text, and most are illustrated. The text was probably added after the illustrations, and shows no evidence of scratching or correction. The text is written left to right in paragraphs that are left-aligned, justiﬁed, and divided by whitespace into words. Paragraphs do not span multiple pages. Under the most used transcription, as there are ambiguities, the VMS is comprised of 8114 word types, and 37919 word tokens. Based on the illustrations, the manuscript has traditionally been divided into six sections: (1) herbal, containing drawings of plants; (2) Astronomical, containing zodiac-like illustrations; (3) Biological, mainly containing drawings of female human ﬁgures; (4) Cosmological, consisting of circular illustrations; (5) Pharmaceutical, containing drawing of small containers and parts of plants, and (6) Stars (sometimes referred to as Recipes), containing very dense text with drawings of stars in the margins. Currier (1976) observed from letter and substring frequencies that the text is comprised of two distinct ‘languages’, A and B. Interestingly, the Biological and Stars sections are mainly written in the B language, and the rest mainly in A. The word frequency distribution follows Zipf’s law, which is a necessary (though not sufﬁcient) test of linguistic plausibility. We also ﬁnd that the unigram word entropy is comparable to the baseline texts. The Voynich Manuscript has more than 200 pages, divided up into twenty quires (as per the following links). The first 7 quires are standard quires consisting of 4 nested bifolios each. Quire 8 once consisted of 5 such bifolios but only 2 remain. From quire 9 onwards, quires often consist of only one or two multiple folding bifolios. Exceptions are quires 13 (5 standard bifolios) and 20 (7 standard bifolios of which 6 remain). Further details are available at the description of each quire. This section is designed to contain commentaries on features spanning multiple pages of the VMs. ↑ Steindl, Klaus; Sulzer, Andreas (2011). "The Voynich Code — The World's Mysterious Manuscript" (video). http://www.newyorkfestivals.com/winners/tvf2011winners/pieces.php?iid=413203&pid=1. Retrieved November 6, 2011. ↑ Stolte, Daniel (February 10, 2011). "Experts determine age of book 'nobody can read'". PhysOrg. http://www.physorg.com/news/2011-02-experts-age.html. Retrieved February 10, 2011. ↑ Pelling, Nick. "Voynich theories". ciphermysteries.com. 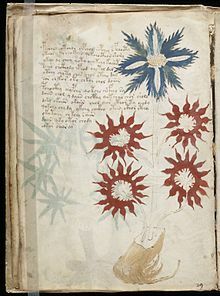 http://www.ciphermysteries.com/the-voynich-manuscript/voynich-theories. Retrieved December 4, 2011. ↑ "MS 408". Beinecke Rare Book and Manuscript Library. http://brbl-net.library.yale.edu/pre1600ms/docs/pre1600.ms408.htm. Retrieved December 6, 2011. ↑ "Voynich Manuscript". Beinecke Library. http://beinecke.library.yale.edu/digitallibrary/voynich.html. Retrieved December 4, 2011. ↑ The McCrone Associates report dated 1 April 2009 is published online by the Beinecke Rare Book and Manuscript Library, Yale University. See link in Citation #6.
http://www.voynich.net/ - starting point for the English-language VMs. mailing list (started originally in 1991). This page was last edited on 1 September 2018, at 18:55.